For more than 40 years, Carlos Santana has been producing music — first on vinyl, and later in CD and MP3 formats — that has established him as a seminal guitar player and songsmith. And though his style has certainly changed over this years, one constant has been the recognizability of his guitar work: when Carlos Santana is playing, you know without a doubt who it is. Luckily, the amazing body of work has been preserved on a myriad of Santana CDs, vinyl records, MP3s, DVDs, tapes, and any other format that has been used over the years. Because of this collection, we're able to trace the course of Carlos Santana music and guitar playing for over four decades. From '70 to '72, working mostly with the original 6 members (a notable exception being the addition of wunderkind Neal Schon for the last album of the group), Carlos established a raw, uneven sound that's very inconsistency belied its power. Due in great part to the vagaries of the equipment he was using — especially his modified Fender Princeton amplifier — Santana was forced to use various tricks to get the sustain he craved. Lacking the slickness of his later tone, Santana's guitar was more part of the ensemble than the unquestioned lead instrument. 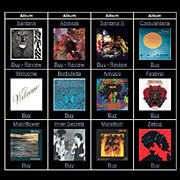 Yet all the songs on the first (Santana, or Santana by Santana), second (Abraxas), and third CDs (Santana, or Santana III) offered a mix of polished production and somewhat uncontrolled instrumental sounds that worked exceedingly well. In fact, Carlos Santana's greatest hits — Evil Ways, Black Magic Woman, Samba Pa Ti, Oye Como Va, et al — came from this period. Starting in 1973 and continuing for the next 25 years, Carlos Santana changed band members many times, as he explored different musical genres. The experimentation of Caravanserai, the jazz-rock fusion of Love, Devotion, Surrender, the hard-edged pop leanings of Inner Secrets; vastly different styles, held together by the growing lexicon of Santana's guitar work. It was early in this period that Carlos began his relationship with amp manufacturer Mesa Boogie and guitar company Paul Reed Smith (PRS) — both of which became integral parts of the fat, super-sustained guitar tone for which Carlos has become legendary. By coincidence, as Santana was polishing his guitar tone, the music industry was shifting from vinyl to compact disc (CD) technology. Of course, the most startling transition in Santana's career was the abrupt change from fading Latin-rock legend to world-wide brand name. Through the impetus of impresario Clive Davis' veteran hand and the album Supernatural, Carlos Santana became a marketing force that beggars description. Perfume and cologne, women's shoes, even wine has been marketed under his name. In addition, the steady output of Santana CD after Santana CD has been phenomenal — providing not only a venue for dozens of other artists, but also a way for Carlos Santana to maintain his stature.